Jerusalem and NYC Mayors visit victim wounded in last week's car attack in Jerusalem's Geula, in which his cousin was murdered. 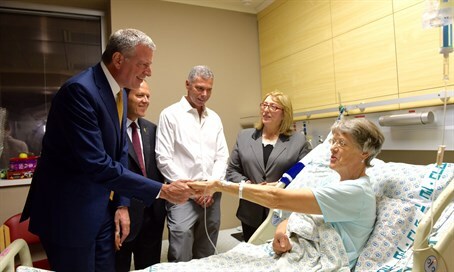 New York City Mayor Bill de Blasio joined Jerusalem Mayor Nir Barkat on Saturday night, in a visit to wounded terror victims currently receiving treatment in the capital's Hadassah Ein Kerem Hospital. One victim they met was moderately wounded in a car attack last Tuesday, in which a terrorist employee of Bezeq first ran over passersby in the central Geula neighborhood with his company car before getting out and hacking and slashing with an axe and knife. Another victim, Rabbi Yeshiyahu Krishevsky, was murdered in the attack. In the footage of the visit to the hospital, Barkat can be heard explaining that the victim suffered an ax wound that was very close to being critical. The terrorist was shot and killed by a security guard. The mayor goes on to explain to de Blasio that the murdered Rabbi Krishevsky was in fact the cousin of the victim, and that he was a well known mohel who performed ritual circumcisions. While at the hospital, de Blasio and Barkat also met with other victims of the recent wave of Arab terror.